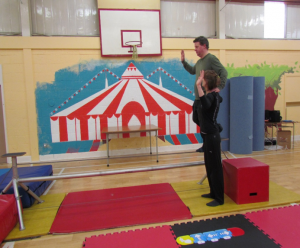 Coaching Teens with Down Syndrome ScratchJR through Circus Arts. Last summer 2015 I was volunteering at Arts Summer Camp for teens with Down Syndrome. On the last day, I noticed a small gang of teenagers in the corner packing their bags, getting ready to head off for the day. As typical teenagers, each one had to check their mobile phone for updates and messages. I was chatting to them and asked about the kind of apps they are into. The reply: Whatapps, Facebook, Twitter, Instagram. So it was from there that my idea was born. These teenagers, who happen to have Down Syndrome, would be well suited to learn how to code using ScratchJR. 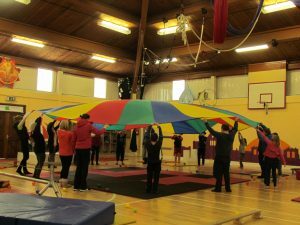 This is a Pilot for both Galway Community Circus, Down Syndrome Ireland Galway Branch and are very excited at the possibilities. 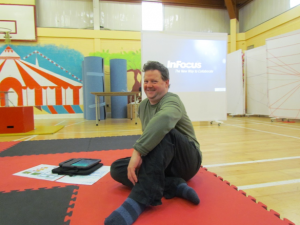 I looked into the ScratchJR app and found that it would be the perfect tool on which to base a workshop for teens with Down Syndrome in Galway. My idea was to do this unconventionally without the constraints of a desk or classroom environment. 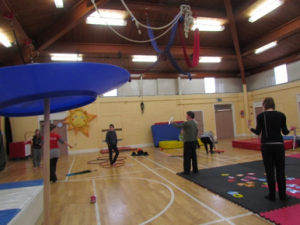 Thanks to the support of the SAP volunteer Project, Galway Community Circus were able to hold the Joy of Code Workshop via Circus Arts, for Teenagers who are members of Down Syndrome Ireland Galway Branch. 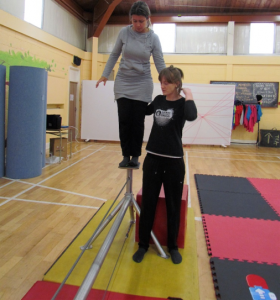 Galway Community Circus is a charitable organisation built on fun, innovation, and a commitment to inspiring and empowering people through circus arts. 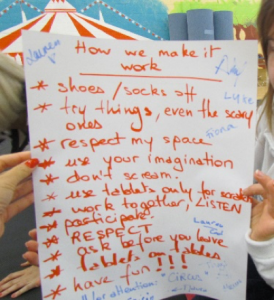 The freedom we had in the Galway Community Circus facilities enabled an atmosphere of creativity, imagination and possibilities we could simply not have created in the classroom. 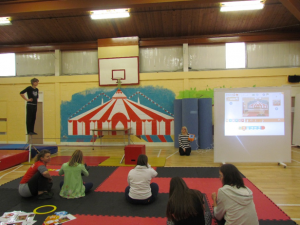 We had a mix of ScratchJR coaches from SAP who are Software Engineers and the tutors from Galway Community Circus who are artistic performers. The combination worked really well together. This was a pilot workshop, for which we had no template, so we designed a workshop deciding on instinct what we thought would work. And and it did: we were able to bring the Arts and Tech together for a great learning experience for everyone. For sessions of two hours over three days during the schools’ mid-term break we worked on projects with the teenagers. 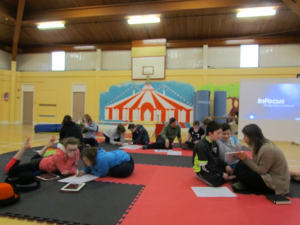 The teens, SAP Coaches, and Circus Tutors had six hours to get to know each other, learn the ScratchJR commands, formulate ideas, put them into ScratchJR, and present their creation to their friends and family. No pressure! 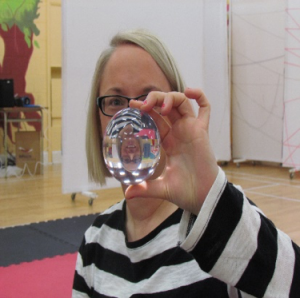 We kicked off by doing a warm up exercise getting to know everyone and using the glass ball to express our wishes for the workshop. Everyone agreed on a how we work contract and signed the contract before we kicked off. 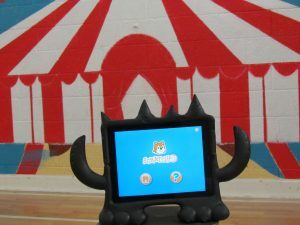 We then got familiar with the ScratchJR Commands, we matched the commands up with some of the circus arts activities. 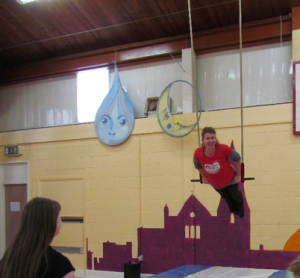 Even our coaches practiced walking the tight wire and trapeze. The objective was to do the activity then to get the animated character of the scratch cat to do the same in ScratchJR. The coaches gave a demo of the Scratch Cat walking the tight wire using the commands which we became familiar with – simple command move left, move up, move downs etc. The teens put tiles representing each movement – the code – underneath the tight wire as we were coding the animation. Our Tutor Lauren, had to follow the commands to walk across the tight wire. The Teens followed along on their tablets. ScratchJR Idea’s was the next stage, after we started to get to know the commands and saw a demo we then coached the Teens on whatever idea they wanted to create. They brainstormed their own ideas on a whiteboard then started to apply to the ScratchJR whatever they wanted their creation to be. The coaches coached them to make it a reality. The coaches assisted the teens in clarifying what they wanted to do, to get everyone engaged on their projects. This proved successful as these teams of coach and teen stuck with their project until the end of the workshop for their presentation. To re-enforce ScratchJR commands we introduced Robot Games. These were very popular. We worked in teams of three – one controller and two “robots”. The controller had a number of commands to “control” the robots – press the red nose to start, walk forward, turn left, turn right, step up , step down. The game begins with the robots standing back to back and walking away from each other. The objective was to use the commands to manoeuvre the robots so that they ended up standing face to face. 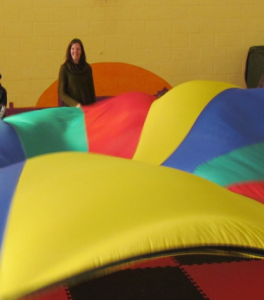 We had our real life robots, jumping on the trampoline, walking across the tight wire, banging into doors, getting stuck all over the place. Our Teens had to work very hard to get the robots back together again. The end of the workshop came all too soon. All of the Teens opted to present their own ScratchJR animation to an audience on the last day, mostly, very proud moms, dads and siblings. They first ran the animation they had created, then opened out the code to explain how they coded the program to make the objects move around the screen. One of my personal favourite was the Michael Jackson hat trick were you have a circus hat on, you flip off your head and catch it in your hand and flip it back up again. 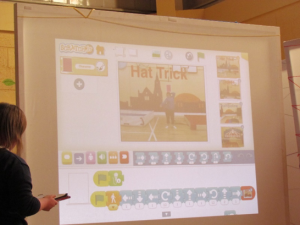 Of course we had to master the hat trick for real then design the hat in ScratchJR and develop the code to get the hat moving up and down the character. It was really fun to create. 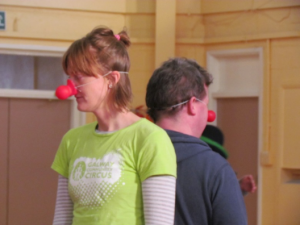 “When I saw the email that Fiona was looking for volunteers for Code Workshop via Circus Arts it didn’t make me long to apply for it. 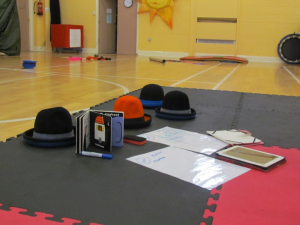 To be honest I had no idea what to expect but the thought of teaching Scratch Jr programme through Circus Arts seemed like opportunity I didn’t want to miss. And I definitely was not disappointed. 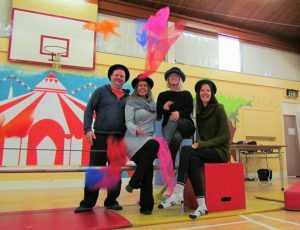 Thank you to DSI Galway, GCC The Circus Arts, SAP CIF, SAP Volunteer Coaches for making this happen.